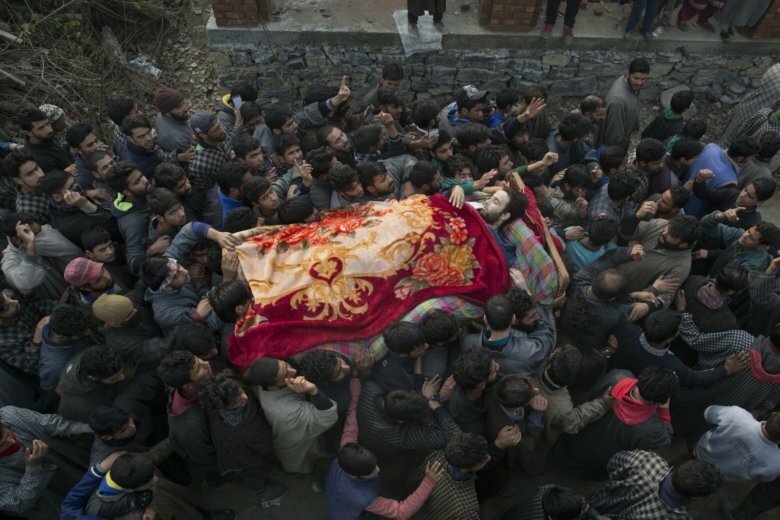 SRINAGAR, India (AP) — Indian security forces killed six suspected insurgents in a fierce exchange of gunfire early Friday in the Indian portion of disputed Kashmir, police said. The shooting took place when security forces attacked a suspected rebel hideout in the foothills of the Waghama Sutkipora area of south Kashmir, a police statement said. News of the deaths triggered protests by hundreds of civilians opposed to Indian rule. They took to the streets in at least four places in south Kashmir’s Anantnag district and clashed with government forces while chanting anti-India and pro-rebel slogans. Security forces fired in the air and used tear gas to disperse the protesters, who attacked them with rocks in the Khanabal area of Anantnag town, witnesses said. There were no reports of any injuries. Police said security forces recovered six bodies and the rifles carried by the suspected rebels. Rebel groups have been fighting Indian rule since 1989 demanding Kashmir’s independence or merger with Pakistan. About 70,000 people have been killed in the uprising and the ensuing Indian military crackdown.